The western nations of the world have built their great wealth and societies on the exploitation and plundering of the people and resources of the rest of the world. The wealth, freedom, and structures of our societies have been built on the starvation, robbery, deprivation and murder of millions upon millions of the world’s people, both historically and presently. It seemed for a time that “Western Civilization” had worked, even if only for the west. We saw the emergence and growth of a vibrant middle class, which has its origins in the Industrial Revolution, out of which we also saw the formation of the “nuclear family.” The middle classes of the west grew in wealth, education, and access. While the great problems of the world, and for the majority of the world’s people, persisted and expanded exponentially, the great purpose of the middle class was siphoned and expanded into facilitating the development of a massive consumerist society. The function of the middle class became that of consuming, not necessarily contributing to determining the direction of society. Nevertheless, life was good; or so it seemed. Thus, the people were by and large able to turn a blind eye to the plight of the world’s majority. As the decades progressed, however, the great western empires, increasingly united under the umbrella of a US-led NATO empire, grossly expanded their plundering and exploitation of the rest of the world. New avenues for capitalist expansion needed to be found, more money to be made, more assets to be owned, more power to be had. As a part of this process, class structure was being reorganized, which meant that the middle class was to undergo an evolution. In the past few decades, the middle class has been forced to survive on debt. In order to maintain the image of middle class, and to maintain the functions of the middle class (i.e., to consume), the middle class needed access to credit and had to descend into a class of debt. Now, as the world is undergoing a rapid social, political, and economic transformation, the middle class has been marked for death. As a debt crisis takes the nations of the world into debt servitude, the middle classes of the western world will lose their access to credit, and will be forced into repaying their debts. As nations fall under a debt crisis, the middle class will collapse with it. A class built and sustained on debt is not sustainable. We are entering into a period of rapid class transformation on a global scale. The mirage of the middle class is steadily vanishing as our eyes adjust to the reality of our environment. The Empire we turned a blind eye to abroad, is about to hit home; what we do abroad, comes home to roost. The middle class is about to realize the true cost of empire. In 1958, the first successful modern credit card was launched by Bank of America, eventually evolving into what we know as Visa. The origins of MasterCard date back to 1966. The expansion of credit card usage grew exponentially through the following decades. "The industry's most profitable customers, the ones being sought by creative marketing tactics, are the "revolvers:" the estimated 115 million Americans who carry monthly credit card debt. [. . . ] Some experts say the profitability of credit cards really began twenty-five years ago [in 1979], when the banking industry successfully eliminated a critical restriction: the limit on the interest rate a lender can charge a borrower. Deregulation, coupled with a revolution in technology that enables the almost real-time tracking of personal financial information and the emergence of nationwide banking, has facilitated the widening availability of credit cards across the economic spectrum. But for some, the cost of credit is often far greater than it appears." "Between 1980 and 1990, the number of credit cards more than doubled, credit card spending increased more than five-fold and the average household credit card balance rose from $518 to nearly $2,700. With the cost of money sinking and average balances climbing, profits soared." In 2004, “the total amount of outstanding revolving consumer credit, which is primarily credit card debt, reached $743 billion,” which was “nearly nine times the amount recorded 20 years” prior. Thus, “Credit card debt collection has not only become essential, it has become very profitable. The most recent data indicates credit card debt collectors generated $1.2 billion in revenue” as of 2004. "That high debt, resulting from stagnating wages while low interest rates have encouraged families to borrow, means consumers are living close to the financial edge, and ready to cut spending at any sign of economic trouble." One prominent economist even stated that, “The rate of consumer spending is not sustainable unless there is a noticeable pickup in the pace of income growth.” This has not occurred. "Despite a growing economy, a rising stock market and stronger corporate earnings that are helping the rich get richer, the middle class in America is caught in an unprecedented squeeze that makes it increasingly unstable." "To maintain day-to-day consumption, Americans are taking on record amounts of consumer debt, researchers say -- $5.2 trillion since 2001. In June 2006, families took on debt equivalent to 129% of their disposable incomes, a big increase from the 96% in March 2001. Many homeowners are tapping into the equity in their homes, assuming more debt to pay for escalating energy and health-care costs. Falling home prices could force many of these middle-class families into foreclosure or back into apartments. Middle-class families are also struggling with the ballooning costs of higher education. The total cost of tuition, fees, and room and board at four-year public colleges has increased 44% in the past four years." "[T]here are more credit cards than people in the UK (67m, to be precise), and that personal debt is so huge Britain is more indebted than Argentina. If interest rates go up, the experts warn, the effect on ordinary people could be like a “time bomb”. Credit card debt accounts for £2 billion and Britain has in total a £1 trillion debt mountain." The middle class in Britain has been plunged into a personal debt crisis, as professionals across the nation fall into the red. The middle class has been spending beyond its means; however, easy access to credit has been aided and abetted by the banks and financial institutions that gave away credit cards and loans without proper financial checks. "[S]tarting in the 1990s our attitude to debt changed. As interest rates fell and soaring house prices made everyone feel richer, our nation of savers became a nation of borrowers. Debt emerged as the great enabler, the ticket to the trappings of a better life, to flat screen TVs and shiny new SUVs. Now the upward march of real estate has reversed course, taking the household net worth of Canadians with it." In August of 2009, Bank of America released a report in which they explained, “The consumer debt problem in the economy really is a debt problem for the middle class. The need to work off a chunk of that debt will sap middle-class families’ spending power for perhaps years to come.” The twisted irony here is that institutions like Bank of America encouraged and facilitated debt-based consumption, and engaged in far riskier debt-based transactions on a global scale, which caused the global financial crisis. Subsequently, the banks, like Bank of America, were given a blank check by the government that bought their bad debts, and are now going to charge the taxpayers, of which the Bank of America report states they need to “work off a chunk” of their own personal debt. They forgot to mention that the taxpayers would also be paying off the bankers’ debts, too. "In terms of their debt burdens, neither lower-income families nor the wealthy are constrained the way the middle class is constrained. . .
[The report] says the middle-class has suffered more than the wealthy from the housing crash because middle-class families tended to rely more on their homes to build savings through rising equity. Also, the wealthy naturally had a much larger and more diverse portfolio of assets -- stocks, bonds, etc. -- which have mostly bounced back significantly this year." Thus, the consumer society has already altered. It will no longer be the middle classes that are the consuming class, but the wealthy. The middle class will be forced to deleverage and buckle under their debt burdens. This is only a radical acceleration of a several-decades long trend in Western society; the economic crisis simply sped up this process and is exacerbating its compound effects. Do not deceive yourself, this has been a long-time coming. "When interest rates start to rise payments on these mortgages will rise to the point where some borrowers won’t be able to manage. 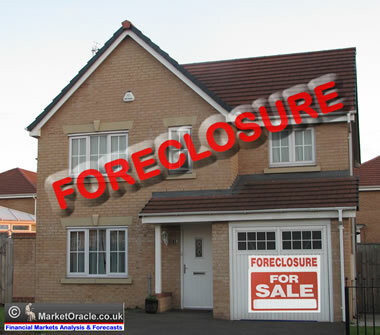 The fear is that foreclosures will then increase and there will be a repeat of the market collapse that started in the United States in 2007." As a result of the credit crunch in Canada, middle-income families have actually been increasing their credit and debt in order to stay afloat. In May of 2009, “household debt has reached an all-time high of $1.3 trillion in 2008,” as “Canadian families are financing consumption activity with unearned money as they increasingly reach for credit to finance day-to-day living expenses.” In October of 2009, the Bank of Canada reported that total household debt had risen to $1.4 trillion. In 2008, the average Canadian had a personal debt of almost $39,000, and the trend was on the rise. 58% of Canadians said their borrowing is to finance day-to-day living expenses. Between September 2008 and September 2009, 148,373 Canadians went into bankruptcy, with the trend rapidly increasing on a monthly basis, suggesting that the financial situation of Canadians is only getting worse. "It turns out that while total debt outstanding dropped by $93 billion, charge-offs added up to $83 billion — which means that only 10% of the decrease in credit card debt — less than $10 billion — was due to people actually paying down their balances." "Then two things happened: the panic started wearing off, and unemployment continued to rise. The urgency of paying down debt ebbed, even as spending naturally continued in the face of country-wide layoffs. And as a result, credit card debt continued its natural upward rise." The only way to stem the rise in credit card debt is to increase employment so that people can afford to pay off their credit card debt. However, due to governments bailing out the banks at trillions of dollars, the governments have put themselves at great risk of a fiscal debt crisis; thus, to pay off their debt, they will have to cut spending, which means exacerbating the unemployment rate, not stemming it. The middle classes of the western world, surviving only on debt, are about to be subject to a “class default.” The wealthy class will be the consumption class, as the middle class is absorbed into the lower class and labour work force. As the Guardian reported in September of 2008, at the height of the global financial crisis, “Universities are producing too many graduates, leaving more than a million people in jobs for which they are over-qualified.” Thus, there are too many graduates and too few jobs. "1) was without a job in the reference week; 2) made an effort to actively search for a job in the last four weeks; and 3) was available for work. A person who is not employed and does not meet this definition of unemployed is considered out of the labor force." So, if you are unemployed and have given up on searching for a job, you are not counted in the statistics of unemployment. Further, if you are surviving on part-time work, you are not counted in the unemployment statistics. Students who can’t find a job and return to school are not counted among the unemployed. Thus, the official government numbers are a gross misrepresentation of the true degree of the crisis in employment. From March of 2008, college graduates began abandoning the labour force, while high school graduates have been joining it. Many unemployed college graduates also decide to return to school instead of search for work. “Over the same period, the unemployment rate has risen more than twice as much for high school dropouts as for college graduates.” However, following March of 2008, when Bear Stearns collapsed and the severity of the financial crisis began to rear its head, the unemployment rate for college graduates accelerated and less-educated workers were increasingly getting the few available jobs. As economist Alan Krueger explained, “If funds for investment are not available because of the financial crisis, however, companies will hire fewer skilled workers.” Thus, we will see a trend in which college graduates will increasingly have to take up jobs in the service and labour economy. In January of 2009, it was reported that a poll of the UK’s 100 best-known companies revealed that, “Students face a "very slim" chance of a graduate level job” over the summer of 2009, as one in six graduate-level jobs have already been cut. The intake of new graduates was to be cut by 17% over 2009. "They are among an army of graduates emerging from the education system who face the toughest employment prospects for years as the recession deepens. The government, having encouraged youngsters into higher education that has saddled many with large debts, is deeply worried. Graduate numbers are hitting a record high just as the number of jobs is shrinking." "The jobless rate among college graduates has more than doubled from a year ago to 4.3 percent. Almost 2 million college graduates are unemployed and a recent survey by the National Association of Colleges and Employers predicts companies will hire 22 percent fewer graduating seniors than they did last year." "For people just starting their careers, the damage may be deep and long-lasting, potentially creating a kind of "lost generation." Studies suggest that an extended period of youthful joblessness can significantly depress lifetime income as people get stuck in jobs that are beneath their capabilities, or come to be seen by employers as damaged goods." "For 20- to 24-year-olds, the jobless rate rose four-tenths of a percent to 16% in November, even as unemployment nationally slipped to 10% from 10.2%." "As college tuition has soared past the stagnant limits on federal aid, private loans have become the fastest-growing sector of the student finance market, more than tripling over five years to $17.3 billion in the 2005-06 school year." "[M]ore than two-thirds of all students now borrow money to finance their education, up from less than half in 1993. Among undergrads who borrow, the average finished school in 2004 with loans of $19,000, up from $9,000 a decade earlier." "Master's students who borrow, however, finish with an average $36,000 in loans; law students with $66,000; medical students with $106,000; and dental students with $143,000." The Los Angeles Times reported in December of 2008 on the debt trap students are drawn into, where high interest rates and fees aren’t disclosed up front. The article tells the story of one girl who graduated with a bachelor’s degree in photography with $140,000 of debt, “some of it at interest rates as high as 18%. Her monthly payments are roughly $1,700, more than her rent and car payment combined.” She had taken the loans simply to pay for tuition. One interesting fact to know is that the student loan market is worth (as of December 2008) $85 billion. Yet, the $700 billion bailout granted by Congress to the bankers would also benefit student-loan companies, which “will unfairly reward companies that have profited from writing risky loans to students.” Meanwhile, the students suffer. A ‘real’ stimulus or ‘bailout’ would have been a student debt bailout; clear the slate and let students start anew. "The two disillusioned attorneys were victims of an unfolding education hoax on the middle class that's just as insidious, and nearly as sweeping, as the housing debacle. The ingredients are strikingly similar, too: Misguided easy-money policies that are encouraging the masses to go into debt; a self-serving establishment trading in half-truths that exaggerate the value of its product; plus a Wall Street money machine dabbling in outright fraud as it foists unaffordable debt on the most vulnerable marks." "Federal and provincial funding cuts to postsecondary education have created this debt crisis by passing the burden of funding our public education system on to those who can least afford it: students. According to Statistics Canada, tuition fees in British Columbia are nearly 10 percent above the national average, at just under $5,000. High tuition fees and student debt have undeniable long-term consequences on students and our society as a whole." "[T]he total amount borrowed by students and received by schools—in the 2008-09 academic year grew about 25% over the previous year, to $75.1 billion. The amount of money students borrow has long been on the rise. But last year far surpassed past increases." Further, odious debts are affecting major life choices of graduates, “forcing them to put off traditional milestones—from buying a first home to even marriage and having children.” Thus, we have entered a period where college graduates face record high levels of debt and unemployment. More and more adults are moving back home instead of buying their own. As Reuters reported in January of 2010, while access to credit everywhere seemed to be limited, “one area of the credit market is rapidly expanding: student loans.” Student loans have risen to unprecedented levels, even in the midst of the economic crisis, and the perceived ‘recovery’. Looking at this in broader economic terms, the private lenders are doing what all the big banks did in the lead up to the financial crisis and the creation of the housing bubble: giving excessive loans to high risk individuals who will never be able to pay back the loan. This has created an “education bubble,” where students would go into extreme debt in order to get an education, and upon graduation would enter an intensely competitive and difficult job market. Even if they manage to get a job, it is likely not in the field of their education, and it is very likely that they will never emerge from their student debt. Students are thrown into debt to take jobs that don’t exist, in order to pay loans they can’t afford on wages they won’t get. Though, the ‘popping’ of this bubble will have a greater social dynamic than economic, there will certainly be an economic dimension, as this is a strong indication of years and possibly an entire generation of slow or negative economic growth. If there are no jobs for graduates, then the skills required for those markets will disappear, and with it, the economic vitality they created. It is, however, the social aspect that poses a still greater threat. With a generation of educated youth thrown into debt servitude and unemployment, a generation of ‘expectations’ is failed. When that happens, students take to the streets. As the debt burden grows for western nations, they will be forced to raise interest rates, thus making payments on debt larger; currency devaluations will be required, in a stated attempt to encourage private investment; however, this will have the effect of causing inflation, where the prices of food and fuel and other essential commodities will rise dramatically. At the same time, countries will be forced to exponentially raise taxes and cut social spending in an attempt to gain revenue while cutting costs, in order to pay off the debt burden and reduce deficits. The result of this will be the decimation of the public sector, as areas of education and health care as well as other public enterprises are dismantled, privatized and sold off to mega corporations and banks for pennies on the dollar, as a devalued currency would make purchasing companies and assets much cheaper than before. Concurrently, a massive privatization of infrastructure will take place, as roads, resources and other public assets are sold to multinational corporations. What will follow is what follows every time this is done in a ‘Third World’ nation: massive layoffs, spiraling unemployment and soaring poverty rates. Right on cue, riots and protests broke out in Greece, with estimates of the number of people protesting between 20,000 and 60,000 in Athens alone. Even police and security forces were protesting many of the measures. Naturally, the riots were met by clashes with the police forces. While Greece descended into crisis, British and American firms partook in aggressive speculative attacks against Greece in money markets, as the derivatives market booms with speculators hedging bets against a Greek default. Portugal, in an attempt to ‘forestall’ a debt crisis, has already begun imposing austerity measures, including “cutting welfare benefits and government hiring as well as selling assets and raising taxes.” Further, “Portugal aims to raise 6 billion euro ($8.2 billion) from privatizations, trim welfare benefits and slash other state expenditure in an effort to reduce the country’s heavy debt load.” This is just the beginning of the austerity measures being imposed in these countries, which are scheduled under programs that are intended to last several years, until the deficits are brought down significantly. "We will not get this economy back on track, recovery will be not strong and sustained, unless we ... can convince the American people that we're going to have the will to bring these deficits down once recovery is firmly established." We must be reminded that Obama’s economic team are all architects of the financial crisis, who in the past played pivotal roles in creating the conditions for the crisis to occur, and who are all closely aligned with the interests of Wall Street banks. They are now in charge of organizing the ‘solutions’ to the economic crisis they helped cause; they are there for the banks, not the people. Geithner was President of the Federal Reserve Bank of New York during the economic crisis, one of the key institutions of banking power, corruption, and the “black-ops outfit for the nation’s central bank.” Now he runs the Treasury. Top White House economic adviser Lawrence Summers was previously Deputy Treasury Secretary in the Clinton administration where he was a pivotal figure is the dismantling of banking regulations and expansion of the derivatives market, both of which were essential facets of the economic crisis. Paul Volcker, another top economic adviser to Obama, a former Chairman of the Federal Reserve Board, was responsible for creating the 1980s debt crisis across the ‘Third World’ by raising interest rates dramatically, causing a wave of countries to default under their debt loads and leading to the re-colonization of the ‘Third World’ by the IMF and World Bank. These are men that should not be trusted to guard your piggy bank, let alone the national Treasury. In March of 2009, it was reported that, “President Barack Obama is putting former Federal Reserve Chairman Paul Volcker in charge of a tax-code review aimed at closing loopholes, streamlining the law and generating revenue.” Volcker, the head of the President’s Economic Recovery Advisory Board, “will be examining ways of being even more aggressive on reducing the tax gap.” The tax gap is the difference between taxes that are owed and taxes that are collected. In other words, tax collection will be rapidly and aggressively increased. "Taxing the rich will be one of the hot political stories this year. It will also divert attention from a much bigger story: Sooner or later, almost everybody in America is going to pay more in taxes." Since raising income taxes is widely unpopular, politicians will employ it as a ‘last-resort’, which leads the way for ‘creative’ tax hikes to take place, such as raising state and local sales taxes, and to crack down on tax evasion and increase penalties for filing taxes late. There is also the route of ‘carbon’ and energy taxes. Health care taxes are also likely to increase, as several states had already raised taxes on hospitals. The federal government could also reduce aid to states, forcing them to cut their own spending. However, again, the “holy grail” of tax experts is the value-added tax (VAT), which would have the effect of simply raising prices. In early February of 2010, Obama said he was “agnostic” about raising taxes on the middle class. Obama stated that the government “needs to consider all options for reducing the deficit, including tax increases and cuts in spending on entitlement programs such as Social Security and Medicare.” With the passing of so-called health care ‘reform’, roughly 12 new taxes will be levied against the middle class. The 2010 budget in the U.K. is “to carry out a £19 billion tax raid on the middle classes to help pay Britain’s record debt,” as well as “cuts and savings in public spending.” Business Insider reported, following the British budget assessment, that America will likely have a similar increase in taxes, analyzing potential future taxes that may appear in America. Among these are raising the alcohol tax on a particular drink, such as wine coolers; an increased tax on tobacco, all drinking sales taxes, increased taxes on gasoline, taxes on waste and garbage, increased property taxes, income tax increases, social security tax increases, and a variety of others. In America, such an austerity budget would reduce funding programs for the unemployed, or those searching for jobs, spending on job growth would be cut and “gutted”, child spending would be cut, drug spending would be “destroyed,” dental services cut, retirees would be “ransacked,” salary cuts for public servants, carbon taxes would “hammer” consumers, education and science spending would be slashed, health spending would be cut, and welfare would be slashed. "Eventually, there will be a crisis of such magnitude that the political winds change direction, and become blustering gales forcing us onto the course of fiscal sustainability. Until it does, the temptation to inflate will remain, as will economists with spurious mathematical rationalizations as to why such inflation will make everything OK... Until it does, the outlook will remain favorable for gold. But eventually, majority opinion will accept the painful contractionary medicine because it will have to. That will be the time to sell gold." Make no mistake, a default is coming, and with that, the middle classes of the west should expect to be liquidated through inflation and ‘austerity’. Lest we forget, the reason why the people must pay, is because our governments have imperial foreign policies and serve the interests of powerful economic entities, such as the major international banks they bailed out. As the nations of the western world have, since the onset of the global economic crisis, sought only to save the banks from their own bad investments, they have handed global banks a blank check. The governments bought the bad assets of the big banks, taking the private debt and transferring it to public debt. Thus, the bad practices of banks were and are still being encouraged, as governments have shown their propensity to step in and “save” the banks. Thus, governments have chosen to privatize profit, and socialize the risk; this is the foundation of corporatist state structures, corporate socialism, or what is otherwise known as ‘economic fascism’. In mid-September 2009, the BIS warned that, “The global market for derivatives rebounded to $426 trillion in the second quarter [of 2009] as risk appetite returned, but the system remains unstable and prone to crises.” The derivatives trade had risen by 16% “mostly due to a surge in futures and options contracts on three-month interest rates.” In other words, speculation is back in full force as bailout money to banks in turn fed speculative practices that have not been subjected to reform or regulation. Derivatives markets pose “major systemic risks” for the global financial system. The destructive practice of financial speculation, largely operating through the global derivatives trade, remains totally unregulated and continues to be active and growing. This only suggests that as nations around the world begin to buckle under their debt burdens, the major financial institutions (along with the global central banking system) which were the key architects of the global financial crisis, will now be able to profit from the collapse of nations. Large financial institutions and speculators will be able to engage in capital flight, quickly removing their money from a nation’s currency, speculating that it will collapse, which often becomes a self-fulfilling prophecy. They will thus engage in currency speculation, speculation against debt burdens and national fiscal austerity programs. Countries that do not take the established method of imposing fiscal austerity through “Structural Adjustment” will face a speculative assault. As nations collapse, the banks will grow, further consolidate, and purchase major global assets. This is why the financial system has not been subject to any actual regulations or structural reforms, because the financial crisis is far from over. The banks and mega-corporations must be permitted to grow and profit off of the crisis to come. Surely, several more banks and corporations will collapse, and we will witness an acceleration of the global consolidation of business and banking. However, as nations collapse, the banks and corporations at the top will profit. It will be the people of the world, and the whole world over, who will be forced to pay for the crisis caused by the international collusion between banks and governments. Incessantly high taxes, rising inflation, mass unemployment and growing poverty will plunge the western world into a social crisis the likes of which have never before been seen. "One process central to capitalist globalization is transnational class formation, which has proceeded in step with the internationalization of capital and the global integration of national productive structures. Given the transnational integration of national economies, the mobility of capital and the global fragmentation and decentralization of accumulation circuits, class formation is progressively less tied to territoriality." As governance ‘goes global’, social structures must follow in step. Globalization has led to the formation of a truly global economy, where states have less influence in global economic factors, and increasingly the world economic system is controlled by a powerful minority of banks, international financial institutions, and corporations. This process has been facilitated by the major nations of the world, primarily the United States, and it has in turn led to the formation of a truly global ruling class. David Rothkopf refers to this global class as the ‘Superclass’ and has concluded that it is a class consisting of roughly 6,000 individuals, roughly one member of the ‘Superclass’ for every one million people. The economy has been effectively ‘globalized’; the world’s political structures are following the economy in being ‘globalized’, as nation states are reorganized into regional governance blocs modeled on the European Union, and ultimately a global state apparatus emerges. Concurrently, global social structures will also have to be ‘globalized’. The majority of the world’s nations do not have a vibrant middle class population. For a global state to form, global class structures must be totally transnationalized; the ruling class is not the only global class structure to be formed, it is simply the first to be transnationalized. Thus, we have a situation in which we will see an increasingly concentrated global ruling class consolidate their control over the global levers of power while a global labour class is transnationalized, meaning that the middle classes of the world have been marked for liquidation. This, however, is not a new phenomenon. The middle classes of the western world, primarily that of the United States, have for several decades, been subjected to the erosion of their material wealth. The middle class exists in theory; it is a class built and sustained by debt. As the middle class evaporates into the lower labour-oriented class, there will be a number of major social changes that take place. As the Industrial Revolution changed class structure, the Post-Industrial Revolution will do the same. Suburbia will need to alter its landscape, as lawns become gardens for growing food. The family unit itself will significantly alter. As the Industrial Revolution led to the formation of the ‘nuclear family’, the Post-Industrial Revolution will lead to a re-emergence of the extended family, with multiple generations of families living together in the same house. Communities will have to come together or fall apart. Now 49 million Americans -- 16.1 percent of the population -- live in homes with multiple generations. Many include adult children in their 20s." We are entering into the era of the ‘Post-Industrial Revolution’, a ‘class cleansing’ of the western world. The entire socio-political economic landscape is being redrawn and reorganized. The effects will be felt from the wallet to the family unit, itself. Andrew G. Marshall is a Research Associate of the Centre for Research on Globalization (CRG). He is currently studying Political Economy and History at Simon Fraser University. Disclaimer: The views expressed in this article are the sole responsibility of the author and do not necessarily reflect those of the Centre for Research on Globalization. The contents of this article are of sole responsibility of the author(s). The Centre for Research on Globalization will not be responsible or liable for any inaccurate or incorrect statements contained in this article. In a way, I dont pity them...including those I know. For years, the middle class snobbery was 'oh, were better than "them"' meaning the lower/working class, without realising money isnt something that can be rolled up and smoked. Now, irony takes a shot at them and their snobbery with the reports by the media a while ago the middle class were stealing organic and 'expensive' chickens from supermarkets..thus reducing themselves far below the people they once looked down on. Just a few months or a year before, any thief to them would have been scum, unworthy of life, yet they resorted to this. They are now driving cars which are substantially less 'luxurious' and more typical of the 'working class' and they are having to downgrade their properties to pay off debt/their mortgages. A car worth less than £30,000 to them a few months before would have been a topic of laughter at their latest 'dinner party' - which was effectively funded by debt. I would like..no love, to think they may have learned from this, but Im expecting in five maybe even ten years from now they'll revert back to the snobbery. Selectively forgetting that it was they who had to steal chickens, selling off their medium sized properties to pay off debt, and generally lower their own lifestyles in order to keep afloat, whilst the average working/lower class citizen made do...like the majority always did and no doubt always will do. Im glad my upper-middle class background had a big influence from my grandparents, who were working class back in the 20s. Their opinion was that debt above 10% of yearly income is a burden, and I share this opinion. The discussion of the lack of jobs that require a college degree was very informative and is a subject that clearly needs more attention. However,one of the most important aspects of the situation was overlooked. Although it is true that many recent college grads are also often more willing to settle for lower-skilled jobs, an even more significant trend is that the pay for college grads is falling much more rapidly than the pay for non-college grads. As mentioned, each job that requires a college degree is a coveted prize. However, such jobs are not just coveted because they pay more. Just as importantly, having a job that requires a college degree allows for increased status and prestige. Very few college graduates would be willing to work at a menial job, especially one that is as strongly looked down on by society such as being a janitor or fast food worker. Rather than accept a menial job, college graduates will either continue their education or move home with their parents and accept a more austere lifestyle while they continue to try to get a job that requires a college degree. In the US,in spite of the current severe unemployment situation, many fast food restaurants are staffed almost entirely by ethnic minority workers. Without the ability to staff fast food restaurants with Hispanic immigrants many would face a critical shortage of labor as they would not even be able to find enough high school graduates to fill open positions let alone college graduates. Although the premium college graduates receive in wages over wages of those without college degrees is clearly falling, to some extent this has trend has been temporarily restrained. Many employers are willing to continue to pay higher wages if they believe that the economy will soon improve and that such wage cuts would soon be reversed anyway. Employers often expect that the benefits of short term savings with pay cuts would be more than offset by the harm from the antagonism that would result from pay cuts. However, pay cuts will increase when employers realize that the glut of college graduates is not just a temporary situation related to a short term economic downturn. As outsourcing of college degree jobs increases as companies struggle to remain profitable, college graduates will relentlessly drive down wages for such jobs as they compete for the coveted prize of the prestige and status of a college degree job. While even many non-college graduates will continue to reject the most menial and degrading jobs, a college graduate with an accounting degree would be reluctant to accept a somewhat less menial job such as being a retail clerk. He would have the realization that if he accepted such a job, instead of having the status of being an accountant that the expected when he went to college, many of the customers that he served would assume that being a retail clerk was all he was capable of. He would likely think of this every day as he dragged himself out of bed to go to work, and his work would probably not be at regular hours only on weekdays. He would also know that in a social situation, he would not be able to impress any potential romantic partners by telling them that he was a retail clerk. There are some jobs such as lawyers and engineers for which the pay will likely always be higher than for non-college degree. However, for many mid level office jobs such as accounting jobs, it is likely that the pay will fall below that of less prestigious jobs such as retail clerk jobs. Even though many accounting jobs that used to pay the salary equivalent of over $40.00/hour now pay less than $20.00/hour, posted jobs are still often getting several hundred applicants. Wages for accounting jobs will continue to fall until there is more of an equillibrium in demand between accounting jobs and less desirable jobs. Some people assume that with a larger pool to choose from employers will merely become more selective and continue to pay high wages to whoever they choose. However, with several hundred applicants, it becomes very unlikely that an employer would be able to determine just who it is that is so much better than the others that he should be paid significantly more. Very often, it comes down to whoever has the right connection such as a parent who works at a company that is hiring. What is called "networking" often just means "knowing the right people". Although computer automation has increased in offices, studies have show that increased needs for skill that is related to this is often completely offset as computers become more user friendly. Given a little time and assistance from family or friends, many people without college degrees could do just as well in positions for which a college degree is asked for. A college degree requirement for a job is often just a screening process while only a small percent of the skills learned in college are used. When the argument is made that poor education in the US is a major cause of outsourcing, it is overlooked that relatively little education is needed to do a large percent of office jobs and that such jobs can be done overseas sometimes even without much education. To hype the need for education and complain about the lack of quality of education is often merely a justification for labeling the few people who have the right connections to get jobs as being among a small group who are intellectually superior in spite of the low quality of education and deserving of higher pay. In the US, people arrogantly assumed that they were being paid more than workers in other countries because they were smarter and worked harder. Such people now face the reality that in countries that have large populations such as India and China, many people are perfectly capable of performing jobs that require college degrees and prefer working in air conditioned offices to working in sweatshops and rice paddies sweatshops and want the status that comes with such jobs as much as people in the US. In attempts to create justification for a class of workers that have more desirable jobs at significantly higher pay, the rhetorical question of “Why would anyone want to go to the effort of getting a college degree if they don’t get paid way more?” can now be answered by asking whichever of the 300 applicants gets the accounting job at a lower pay than many plumbers or mechanics. In contrast to the accountant who accepts the job at lower pay because he is partly compensated with prestige, a college graduate who accepts a job as a mechanic will need higher pay to compensate for the humiliation of being called a “grease monkey” while doing a job that increasingly requires high skill as cars become more computerized. As outsourcing continues and the US is not able to extract as much wealth from other countries as the dollar loses its reserve status, the ability to pay college graduates with real wages that allow for a high level of consumption of goods and services will decrease as profit margins are squeezed. Jobs will increasingly tend to pay no more than enough to allow for the absolute minimum standard of living that people would accept in return for performing a given job. The pay for many jobs that require college degrees may even fall so far that it becomes commonplace for people to spend part of the day or part of the week working in an office job at much lower pay while working at a less desirable and more difficult manual labor job for the rest of the day or week. If this occurs, a significant benefit would be that for example mechanics would no longer be looked down on as “grease monkeys” if it was assumed that it was possible that you would see the same person on a different day when you went to the CPA office to have your taxes done. Ironically, it could be that free market competition for jobs based on their desirability will create more of an egalitarian society than even many Marxists could have dreamed of in that it will also be more effective in creating equality of status than Marxism. It is clear that in practice, Marxist societies tend to allow for elite groups of people to get the most desirable jobs. Ultimately, rather than being determined by corporations, the decline in standard of living in the US will be determined by the increasing lack of willingness of other countries to use their labor and resources to support the standard of living in the US. Although people in the US may no longer be able to afford such large houses and SUV's, it is equality and fairness rather than any absolute level of material wealth that has consistantly been found to be the most important factor in determining the overall happiness of a society.